It’s a very good product that is tasty and does the job well, and at a good price to boot. That’s why customers have been coming back for Koi CBD vape juice for years and why it would make a great addition to your vape oil collection. 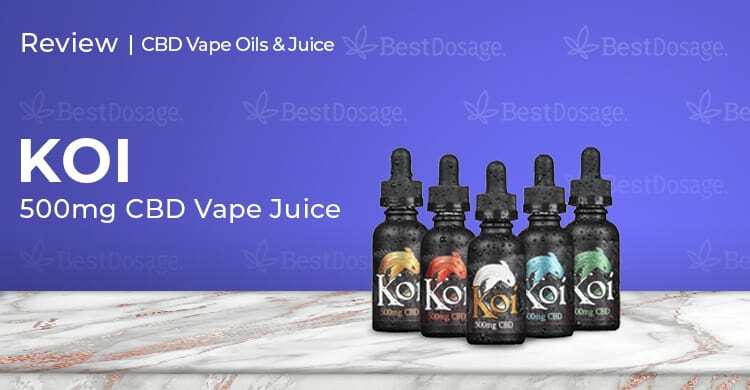 Next up on our CBD vapor reviews is Koi CBD vape juice. They’re veterans of the vape scene as well as of CBD and have grown immensely since launching in 2015. Let’s find out where they are now with this long-standing vape line. Koi CBD started out with a simple concept – they want to help people. Back in 2015 CBD was still very new, and the owners decided to spread the word on what they knew worked. Choosing the persistent koi fish as their logo, they went about creating a brand that was exclusively focused on CBD with no trace of THC. While they started out with a focus on vape juice, Koi CBD has since spread out into gummies, oil, lotion, and more. All Koi CBD vape juice comes in 30ml bottles, with the only difference being the potency. You can get them in 100mg, 250mg, 500mg, 1000mg CBD strengths. These are 100% THC free, like all Koi products, and are isolate-based. They extract their CBD through pharma grade processes in a CGMP (Current Good Manufacturing Process) certified facility. Each batch of CBD is fully traceable from plant to bottle and they provide a full listing of 3rd party lab test results. All Koi CBD vape juice is made with a mix of PG/VG and can be vaped on their own, used as a vapor additive, or taken sublingually. As of this review, Koi is up to 6 different standard flavors as well as one seasonal flavor. Here’s the rundown of their names and the actual flavor of each. With so many flavors to choose from, we went ahead and got the variety pack. It’s a great value since you’re essentially getting five bottles for the price of four. Each came in a black bottle, inside of a black box, and with that trademark koi fish in different colors. The design may be a little outdated compared to 2015, but it still looks and feels like a quality product from the packaging. After loading up our CBD vape pens, we went ahead and tried all of the flavors. On a whole, these were really yummy! The original two flavors, strawberry milkshake (Red Koi) and vanilla caramel custard (Gold Koi), were hits with everyone. A few of us really got into the pink lemonade (Pink Koi), but it didn’t hit the mark for all. Personally, I loved the blue raspberry dragonfruit (Blue Koi), which was a really unique flavor mix. Of course, if you’re all about pumpkin spice in the fall, you can’t go wrong there either. In terms of performance, we were able to get some nice clouds out of the Koi CBD vape juice. After trying it a few different ways, everyone concurred that its flavor tasted best on its own. Koi says you can mix with other e-liquid, but we wouldn’t recommend it. Taking them sublingually was a bit odd at first, but it’s not a bad way to go if a bit too sweet if you take a full dosage like that. Dosage will depend first on the potency level you choose, and how experienced you are with CBD. We went for the 1000mg option, but if you’re new to CBD then choose a lower strength to start with. Either way, take two or three puffs and then wait at least 15 minutes to see if you feel anything. You can up your dosage with more puffs, but as always you should start low and go slow until you find what works for you. The same goes if you take it sublingually as a tincture, except give your body a few hours to absorb the CBD before you reach for more. We all vaped the Koi CBD vape juice and so relief came quickly. The first thing we noticed is that, for those of us suffering from pain, it did absolutely magnificent work. The CBD isolate got right to the heart of the matter. For anxiety, we had more mixed results, with some of our team feeling the difference immediately, while others needed a lot more compared to what they are used to. That might be the isolate versus full spectrum effect in play here. Upping the dosage did help, and most everyone found success with it in the end. It worked especially well for those on the team suffering from insomnia. Koi CBD offers outstanding support. Reps were empathetic and very friendly on their toll-free Koi hotline. They do have a live chat but we found they often were away. Emails and facebook messages, on the other hand, were handled swiftly. Free domestic shipping is offered on orders over $35, which most orders will be anyhow. This is via USPS, but they were rather prompt in delivering our prized package. $29.99 for the small 100mg bottle, all the way up to $99.99 for the 1000mg version. Or you can get the variety pack which ranges between $159.96 and $399.96 depending on CBD levels. Remember that’s like buying 5 for the price of 4. Koi is a bit of an old-school brand, but they still got it. They may not have refreshed their packaging or expanded their flavor offerings in a while, but that’s partly because their customers love what they carry already. This brand has a more local feel to it, and that part is felt with their hands on customer support approach. You certainly get the feeling that Koi CBD cares about their customers. Since this isn’t a full spectrum product, there is none of that earthy flavor to mask. There are pros and cons to using CBD isolate, but certainly, if you want to be sure there is no THC in what you vape, this is a great option for you. It’s a very good product that is tasty and does the job well, and at a good price to boot. That’s why customers have been coming back for Koi CBD vape juice for years and why it would make a great addition to your vape oil collection.